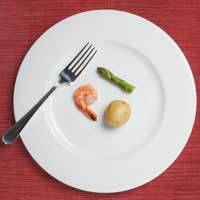 If you eat in restaurants on a regular basis you don't have to ask for a 'super size' to have noticed that food portion sizes are getting bigger and bigger. As portion sizes have grown, so have people's waist lines. And we've not only been eating larger portions in restaurants, we're eating more at home as well. We are often encouraged to buy larger-sized portions because they provide a better value for our money. But while these oversized portions may be good for our wallets, they are not necessarily good for our waistlines or our health. But it's not always easy to judge whether you are getting enough or too much of the right foods. For example, a forty year old woman getting thirty to sixty minutes exercise daily roughly needs about 2,000 calories per day, and is recommended 2 ½ cups of vegetables and 1 cup of fruit each day. No problem. But grains are not so easy to estimate, especially when it comes to pasta, rice and bread, because we are used to eating a lot, regularly. Just one cup of pasta is two ounces. So if the same woman has 2 cups of cereal for breakfast, a sandwich for lunch and a bag of pretzels for a mid-afternoon snack, she's already gone over her daily limit on grains before dinner time. Potion control can make an enormous difference, not just to your weight but also to your health, particularly if you suffer from diabetes. Nine out of ten people with type II diabetes are overweight and may be insulin resistant or insulin deficient or both. When the pancreas doesn't release enough insulin, or when cells don't respond to the insulin released, the consequence is high blood glucose, which if uncontrolled leads to severe consequences including heart disease, nerve damage and even blindness. Regaining a healthy weight and exercising regularly will improve insulin resistance and deficiency and result in blood glucose control. But remember, without portion control, weight control is impossible.